The Aviar is awesome. 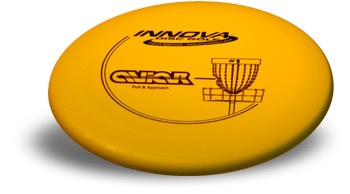 This slow moving, fast fading disc is easy to manuever with precision in putting and approaching situations. It can be thrown with great accuracy on hyzer and anhyzer shots anywhere under 100 feet, but don't try it much farther out than that. The Aviar will lie where it lands, meaning it will not give you the extra feet by skipping or rolling too far, and it fades very quickly, especially on straight shots. This is exactly what we want out of the Aviar; if you miss the shot, it'll flop right next to the basket. This is the disc that made me realize how vital a putter can be in disc golf, and it works well at longer ranges compared to most other putters. I give it an A+ and name it the "Best of Breed." Stop walking in circles around the hole and start putting with confidence: get an Aviar!